Three giant (as in building-sized) murals were installed in the King Historic District yesterday in the latest Living Walls effort to turn structures into canvasses. One such “canvas” is the former Henry’s Grill at 345 Auburn Avenue, where a small crowd turned out to watch an acclaimed muralist at work. 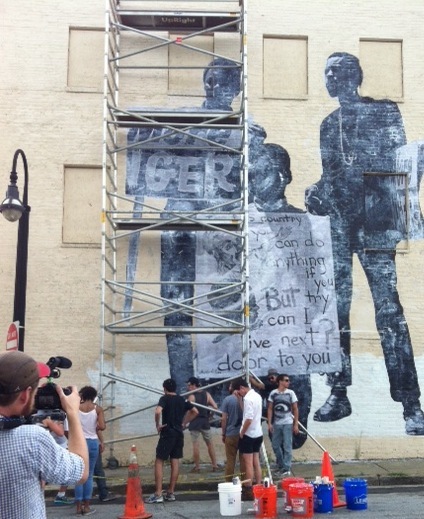 The three King District murals commemorate the upcoming fiftieth anniversary of the 1963 March on Washington for Jobs and Freedom, and were created by the internationally known French muralist, JR. Although press materials and JR’s own bio claim that the artist “remains anonymous,” he was very present yesterday, directing his assistants, and snapping pictures with fans and spectators, among them Kwanza Hall, who represents the King area on Atlanta City Council. The other two murals were scheduled to be installed on Hilliard Street and Edgewood Avenue.